I will start with the positive point. The staff is very friendly and helpful, and the park is close to town. The negative unfortunately outweighs the positive. They say they are big rig friendly, they are NOT. The sites are short and very close on a steep incline on the side of a steep hill. When you pull into your site it is very close not to tumble over the hill into the next site below. You can not walk around your rig since the hillside going up hill makes it difficult. There is no place to park your tow vehicle or towed car. The interior roads are in terrible shape. The trash dumpster was running over onto the surrounding ground and left for animals to make a mess. We would not stay here again. We camped at Rapid City RV Park and Campground in a Motorhome. We stayed here for a month while getting things taken care of for our new domicile state. Since we were not here during tourist season, the park was pretty quiet, and empty except for a few short term people. The owners are the nicest people you want to meet though, greeted you by name. We made good friends with them. The park is terraced, with a nice view of Rapid City below from every site. They were working on the place while we were here, getting ready for tourist season, leveling the sites, painting, really working to make it nice. Not the parks fault, they had a problem with disease in some trees, and had to cut some down before it spread to others. Overall, we liked staying here, and we would stay here again. We camped at Rapid City RV Park and Campground in a Fifth Wheel. Campground is near the city but far from Rushmore and other monuments. Terraced into a steep hill, it is 45% crumbling asphalt, 50% worn gravel and 5% grass. We were promised site Wi-Fi access, even given a code, but later told it didn't reach that far. Pool on the highway was unoccupied. Sites were narrow, not enough room for toad/tower. Vehicles parked at top of hill blocked exit for big rigs; we had to back down to another route. Worst part: the $42 rate was a crowning insult. We camped at Rapid City RV Park and Campground in a Fifth Wheel. The views from this campground are amazing! The sites are reasonably spaced (although do NOT get one on the end!) The check-in process was fast and efficient. No fires are allowed, however they have fire rings available for use. This is a good thing, and a bad thing as fire rings encourage late night gatherings which tend to be noisy. We were parked next to a group of 3 or 4 units who stayed up half the night having a grand time around the fire drinking and partying (it was the day after the Sturgis Bike Rally). A call to the office got them quieted down around 11pm. Other than that, all was fine. There are 2 ways to get to the park from I-90: exit 61 and exit 57. Exit 61 is longer, but far easier. Also, our GPS from exit 57 took us the "scenic" way via Skyline Road (the name says it all!) The park is very convenient to Mt. Rushmore, Chief Crazy Horse, and Custer State Park (all must-sees). We camped at Rapid City RV Park and Campground in a Motorhome. The owners were so helpful and friendly. This park was quiet at night and was a nice facility. We really enjoyed it. We camped at Rapid City RV Park and Campground in a Fifth Wheel. Sites are jammed together, and there is little grass if any, in most sites. Shade is from your neighbor, as there are few trees. But the staff was very friendly and accommodating. The park served its purpose for our trip, but doubt we would stay again. 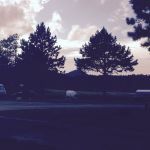 We camped at Rapid City RV Park and Campground in a Motorhome. Sites are narrow: our picnic table leaned to the side because it was falling off our "terraced" site. Hookups were good, restrooms very clean. No grass, only asphalt. WiFi worked, but was slow. Check-in staff was friendly and efficient. They brag about the terraced sites, giving each unit a view. Our view was right into the neighbor's living room. I think it is spin to explain the hills in the campground. We would try another park next time. We camped at Rapid City RV Park and Campground in a Fifth Wheel. We stayed here 5 nights, the owner is very knowledgeable of the area. She gave us suggestions as what is worth visiting and not. We enjoyed our stay. We would stay again. We camped at Rapid City RV Park and Campground in a Fifth Wheel. 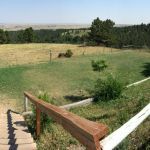 Although this hilltop, terraced campground appears to be well over 20 years old, it is generally well maintained. Only about a quarter of the campsites have a lawn, the rest are asphalt and gravel. The main bath house has been recently remodeled with upscale fixtures and was spotlessly clean. There was excellent water pressure and a strong Wi-Fi signal, although the internet connection seemed to fade out occasionally. There is a small pool and a small play area. The office staff was friendly and accommodating. 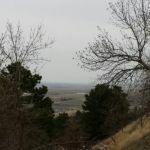 Although the campground’s relatively high price reflects its proximity to Mount Rushmore, about 25 miles to the south, it is still a better value than the very expensive Rapid City KOA. There is an excellent off-leash dog park about two and one-half miles away in downtown Rapid City, along the north bank of Rapid Creek. We camped at Rapid City RV Park and Campground in a Motorhome. Good campground, though the sites were mostly a bit short for long rigs. Laundry was OK and we had a good satellite shot. We would stay again, though the price is a bit high. We camped at Rapid City RV Park and Campground in a Fifth Wheel. Overall the park was nice. The spot we had was right by the front near the highway. Our a/c's took away any highway noise. There was a tree in the way so we could not go forward to leave, we had to back out. We have a 40 ft motorhome. The people in the office were very nice and friendly. They led us to our spot upon arriving. Each site is gravel and asphalt mix. There are very few trees throughout the park if you are looking for shade. The entrance is backwards - you go in on your left (northside) and go out on your left (southside). We camped at Rapid City RV Park and Campground in a Motorhome. Schizophrenic review follows: On the plus side, location is great, beautiful views, not too much hwy noise, staff is mostly helpful, price is right. On the minus side, the "prior owners" have had over a year to fix the damage allegedly caused by the interim owners and have not. Showers have only one control--ON or OFF. The water pressure and temperature are chose for you. A toilet tank lid is broken with sharp edges facing user. Huge holes in the walls. They "fixed" the men's room stoppage by turning the water off and walking away, until someone asked them to please repair the toilet. (There may be better facilities in other areas of the park, but sometimes you need a toilet that isn't a big hike away.) Park needs owners who are good with facilities as well as good with people. We would not stay here again, even with the great price and great views. We camped at Rapid City RV Park and Campground in a Motorhome. Terraced park & we were on the top level which had excellent view of Rapid City. Some road noise if you're close to the road (US16) but bearable, water pressure (and taste) not the best. Bathrooms closed for remodeling/updating. Very clean laundry room & rec room. Very friendly & helpful staff. Would definitely stay here again. 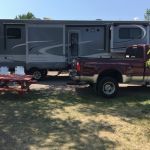 We camped at Rapid City RV Park and Campground in a Fifth Wheel.